Your wireSee telegram of April 9, 1928. saying you would take the carpetThis carpet is no longer in the Dumbarton Oaks Collection. In the ex-collection files, it is described as Rhodian, tomato ground with styled foliage and a geometric border, 7’4” x 4’3”. The Blisses acquired the carpet from Kalebdjian on April 29, 1928. The carpet was sold to Karekin Beshir in December 1952. The carpet was subsequently acquired by John J. Emery Jr. and given to the Cincinnati Art Museum. See letters of January 5, 1928; February 1, 1928 ; February 1, 1928 ; March 13, 1928; and April 9, 1928. and not the ewerThis ewer has not been identified. It was acquired by Hayford Peirce. See also letters of January 5, 1928; January 31, 1928; February 1, 1928 ; February 1, 1928 ; March 13, 1928; and April 9, 1928. reached me in France, dearest Mildred, and I at once informed Kalebdjian: 32,500 fr. I saw it again, and I think it is a great bargain and a very rare and distinguished piece. I saw only one other anything like it in Paris, and not nearly as good in colour or preservation, also smaller, and I was told the last price was 60,000 fr. Hayford had already bought the ewer, so that’s all right. Poor H. is toiling at Bangor, Me., clearing up his mother’sAnna Hayford Peirce (1856–1928), an accomplished linguist and photographer. estate and trying to learn from his father, over 80, the management of that hoary gentleman’s property. He had to do it, and when it’s done he’ll be able, I trust, to spend most of his time on this side so that we may proceed with our work on Byzantine. As you may imagine, the actual management of property is not in Waldo’sWaldo Peirce (1884–1970), an American painter and the brother of Hayford Peirce. Waldo Peirce was a friend of Ernest Hemmingway and spent the 1920s in Paris as a participant of the so-called Lost Generation. His papers are at the Library of Congress. line (Hayford’s brother, the painter) and the one sisterAda Peirce McCormick (1888–1974), a social activist and philanthropist. Her papers are at Arizona State University and the University of Maine. takes no interest in it. I’m sure Hayford was right to go and tackle the business squarely and learn it from the inside—but it’s a nuisance having to interrupt our collaboration. Fortunately we got the Encycl. Brit. articleThis was published in the 1929 fourteenth edition of the Encyclopaedia Britannica. finished just before his mother died. My impression in Paris was that good things were getting horribly rare and dear. I saw Isbirian’sThe Parisian dealer Isbirian has not been identified. In the letter of November 3, 1928, his address is given as 31, rue Saint-Lazare, Paris, and his telephone number as Trudaine 71.01. dish, and I quite understand how Hayford and BabelonJean Babelon (1889–1978), a French librarian, historian, and numismatist at the Cabinet des Médailles, Paris, where he became deputy curator in 1924 and then director in 1937 and 1961. didn’t at first suspect it of being anything but the Stroganoff dish. It’s an extraordinary object, and I’m very glad to have been able to examine it at length. BisbisRoyall Tyler’s nickname for the Parisian dealer Isbirian. asks only $30,000 for it. As he says, it’s worth either a lot or nothing at all. What Bisbis has is a most marvellous set of panels of figured XVI Persian velvets, the decoration of a tent, of the very finest quality, like the few supreme pieces in the Lyons MuseumProbably “fabric with pattern of hunters,” fifteenth–sixteenth century, velvet, Musée Historique des Tissus, Lyon. See Jean-Michel Tuchscherer and Gabriel Vial, Le Musée historique des tissus de Lyon: Introduction historique, artistique et technique (Lyon: A Guillot, 1977), pl. 20. Two additional pieces of the Lyon velvet are known. One was in the collection of Peter Ivanovitch Tschukin, Moscow; see Friedrich Paul Theodor Sarre, Die Ausstellung von Meisterwerke muhammedanischer Kunst in München 1910 (Munich: F. Bruckmann, 1912), no. 2367, pl. 189; and Fredrik Robert Martin, Figurale persische Stoffe (Leipzig: Hiersemann, 1899), 11, pl. II. Another was auctioned by Sotheby’s, London, on October 14, 1998, lot 37. but bigger. He has sold one of them to the Boston Mus. for $40,000 (this I confirmed later elsewhere).A circular tent roof medallion with hunting scenes, mid-sixteenth century, voided silk velvet on satin and metal ground, Museum of Fine Arts, Boston, 28.13.G. This textile was acquired by Mrs. Walter Scott Fitz, who lent it to the Museum of Fine Arts on May 12, 1927, and then gave it on February 2, 1928. G[ertrude] T[ownsend], “A Persian Velvet,” Boston Museum of Fine Arts Bulletin 26 (April 1928): 24–29. He told me the lot came from a Prince Sanguszko,Roman Władysław Sanguszko (1901–1984), a Polish landowner, horse breeder, industrialist, and philanthropist. His relative, Prince Paweł Sanguszko-Lubartowicz (1682–1752), a count and grand marshal of Lithuania, reportedly was a general in the army of John Sobieski at the siege of Vienna in 1683. Prince Sanguszko’s chief residence at Slavuta (now in the Ukraine) housed his famous collection of Persian carpets. head of the great Polish house, and was part of a tent captured from the Turks at the siege of Vienna.The figural voided silk-velvet and metal-thread fragments date to the mid-sixteenth century and are from the Persian Safavid dynasty. They have hunting iconography and were used to decorate a tent formerly in the possession of either the Sanguszko or the Sobieski family in Poland. The tent was captured from Kara Mustafa Pasha, the Ottoman vizier and commander-in-chief, at the siege of Vienna in 1683. How the Persian textiles were acquired by the Ottomans is unknown. Pieces and fragments are in the collections of the Metropolitan Museum of Art, New York (1972.189); Keir Collection, London; Kunstgewerbemuseum, Berlin; and the Textile Museum, Washington, D.C. (3.221 and 3.336). Another piece was auctioned at Sotheby’s on October 12, 2004, lot 13. See Friedrich Spuhler, Islamic Carpets and Textiles in the Keir Collection (London: Faber and Faber, 1978), 173–74, no. 100; N. A. Reath and E. B. Sachs, Persian Textiles and their Technique from the Sixth to the Eighteenth Centuries (New Haven: Yale University Press, 1939), pl. 82 (now in the Metropolitan Museum of Art); Carol Bier, ed., Woven from the Soul, Spun from the Heart: Textile Arts of Safavid and Qajar Iran, Sixteenth–Nineteenth Centuries (Washington, D.C.: Textile Museum, 1987), figs. 8a–b; and Reingard Neumann and Gerhard Murza, Persische Seiden: Die Gewebekunst der Safawiden und ihrer Nachfolger (Leipzig: Seeman, 1988), no. 5, fig. 32. See also Eleanor Sims, Peerless Images: Persian Painting and its Sources (New Haven: Yale University Press, 2002), 111. I dare say it’s true. He also told me that Sanguszko still has the carpet which went with the tent, in flawless condition except for a hole in the centre, and that it is the finest hunting carpet ever seen. Wool, with a border of angels like the Vienna one and varied hunting scenes. Sanguszko has this carpet in a bank in Paris. He was away when I was there, but Bisbis says he will get leave for me to see it in June, after the Geneva meeting. Sanguszko is said to want £50,000. for it. I hear that Behar, who has the carpet sold from the Vienna Museum a couple of years ago,In 1925, the Glasgow rug dealer Victor Isaac Behar, the founder of the firm Cardinal and Behar, London and Persia, acquired from the Vienna Museum für Kunst und Industrie a Persian carpet formerly owned by the Russian czar Peter the Great. See “Art: Rug,” Time, October 11, 1926. The carpet was in the Austrian Imperial House, Vienna, between 1698 and 1921 and the Vienna Museum für Kunst und Industrie between 1921 and 1925. It remained in the inventory of Cardinal and Behar until July 5, 1928, when it was sold at auction by Christie, Manson & Wood, London, to the International Art Galleries of New York for the then record price of $112,500. See “$112,500, Record Price, is Paid for a Rug; Famous Emperors’ Carpet Acquired at London Auction by New York Concern,” New York Times, July 6, 1928. The carpet was sold in 1928 to Arthur Upham Pope on behalf of Edith Rockefeller McCormick (1872–1932) of Chicago. The carpet remained in her estate until 1943, when it was again sold to Arthur Upham Pope on behalf of the Metropolitan Museum of Art, New York, inv. no. 43,121.1. The carpet is Persian, second half of the sixteenth century. It is woven with an asymmetrically knotted pile on a silk warp and weft and measures 759.5 cm x 339.1 cm. See letters of June 26, 1928; July 30, 1928 ; and November 3, 1928. wants £200,000 ($1,000,000); that Vienna carpet, though a grand thing, is in wretched condition and is a poor relation of the great woolen hunting carpet still in Vienna.Tyler’s reference here is unclear and possibly in error. The famous hunting carpet in the Vienna Österreichisches Museum für angewandte Kunst, inv. T 8336, is made of silk and not wool. Tyler seems to make the same mistake in his letter of August 7, 1928. See also letter of April 5, 1926. By discreet inquiries I found out that the Sanguszko in question is a member of the Cercle de l’Union,The Cercle de l’Union, also known as the Cercle Interallié, a social and dining club established in 1917 at 33, rue du Faubourg Saint-Honoré in Paris. and that he comes to Paris fairly frequently and inhabits a princely suite in the Hotel Continental. Have you seen the Dec. 1926 no. of the Art Bulletin of N.Y.? It was sent to me, I know not by whom, the other day. It contains an article, 50 p. long, by Mgr. Wilpert, a Vatican-Boche archaeologist, on early Christian art, the chief object of which is to demonstrate that the Antioch chalice is a forgery.Joseph Wilpert, “Early Christian Sculpture: Its Restoration and Its Modern Manufacture,” The Art Bulletin 9, no. 2 (December 1926): 89–141. During the First World War, “Boche” was a derogatory word for “German.” Joseph Wilpert (1857–1944) was a German art historian and archaeologist. Wilpert’s own domain is the sculpture of Western early Chr. Sarcophagi, and he demonstrates what everyone knew already, that a great many of them have been restored. He then, without establishing any connexion between the Sarcos. and Syrian silver, proceeds to assert that all the Syrian silver that has appeared on the market for the last 25 years is wrong. Your paten and my chalice included, of course, as likewise all the Morgan dishes in the Metropolitan, the censer in the British Museum, the Homs Vase in the Louvre, Boubouk’sRoyall Tyler’s nickname for Tawfic Abucasem. stuffSilver Treasure. of course, and, last but not least, the Boscoreale Treasure. The only reasons he gives are based on what he considers to be inappropriateness in attitude and gestures of the figures. He doesn’t appear to have seen any of the pieces himself, but disposes of the work of the people who have studied them with absurd self-sufficiency. His arguments boil down to this: there are things about the Syrian silver, figures and compositions, which are unknown in Roman art—the only art about which he knows anything, and even there he has no sense of the object itself. I wrote to Rosenberg (who is publishing the Riha paten and chalice as authentic in his new ed. of the monumental ‘Merkzeichen’)Marc Rosenberg, Der goldschmiede Merkzeichen (Frankfurt am Main: H. Keller, 1890). Revisions of this publication were brought out periodically—for example, in 1911 (“2. verm. Aufl. mit einem Anhang über byzantinische Stempel”) and in 1922–1928 (a four-volume publication whose last volume, Ausland und Byzanz, was published in Berlin in 1928). and Rosenberg replied pouring ridicule on Wilpert. As they are both Germans, I’m glad of this—though I’m inwardly perfectly convinced that Wilpert doesn’t know what he is talking about.See also the refutation of Wilpert’s article by Josef Strzygowski, “The Authenticity of Early Christian Silver,” The Art Bulletin 10, no. 4 (June 1928): 370–76. I have had other occasion to appreciate his work, e.g. in connection with the Constantine cup in the Brit. Mus., which he describes as a fake because it wouldn’t, stylistically, hold water as a IV cent. object. The obvious fact being that it is an object of the X–XI cent., when representations of Const. the Great were very popular.The “Constantine cup” is a terracotta bowl with an interior representation of a seated, bearded Christ with a cruciform nimbus; around the image is an inscription, VAL. CONSTANTINVS. PIVS. FELIX. CVM. FLAV. MAX. FAVSTA. Roundels with profile heads of Fausta (left) and Constantine (right) flank the head of Christ, thus purportedly dating the depiction to the period of Constantine’s second marriage (307–326). 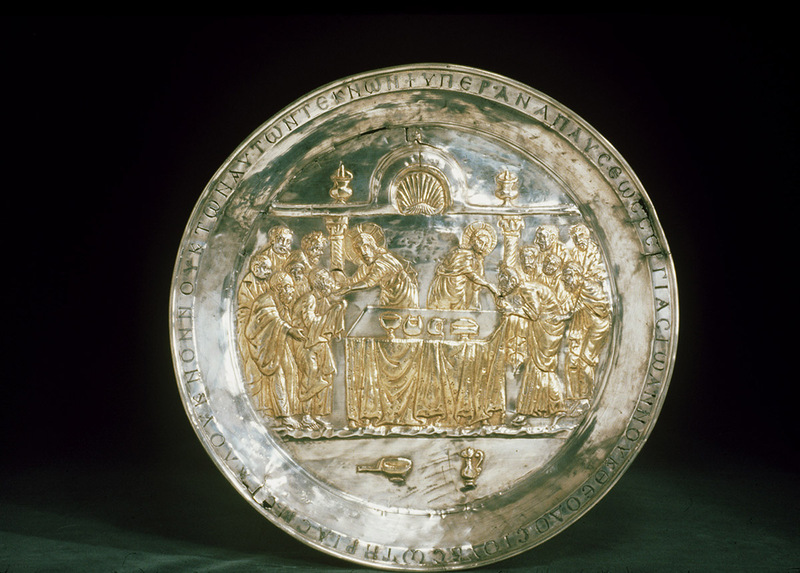 Although the image does appear to be related to eleventh-century Byzantine sources as Tyler claims, the image in the bowl (although not the bowl itself) continues to be considered a forgery. See Mark Jones, ed. with Paul T. Craddock and Nicolas Barker, Fake? : The Art of Deception (Berkeley and Los Angeles: University of California Press, 1990), 177, no. 185. But he (Wilpert) bullied poor DaltonOrmonde Maddock Dalton (1866–1945), keeper of the British and Medieval antiquities department at the British Museum, London, between 1921 and 1928. His two publications—Catalogue of Early Christian Antiquities and Objects from the Christian East in the Department of British and Mediaeval Antiquities and Ethnography of the British Museum (London: British Museum, 1901) and Byzantine Art and Archaeology (Oxford: Clarendon Press, 1911)—served as early standard works on these subjects, owing to their scholarship and the lack of other accessible publications in these fields. into taking the cup out of the show-case. I wonder whether Dalton’s successor will let himself be buncoed into withdrawing the censer.The censer is the “Hexagonal Hanging Censer with Portrait Medallions,” found west of Kerynia, Cyprus, Byzantine, ca. 602–610, silver, British Museum 1899, 4-25.3. 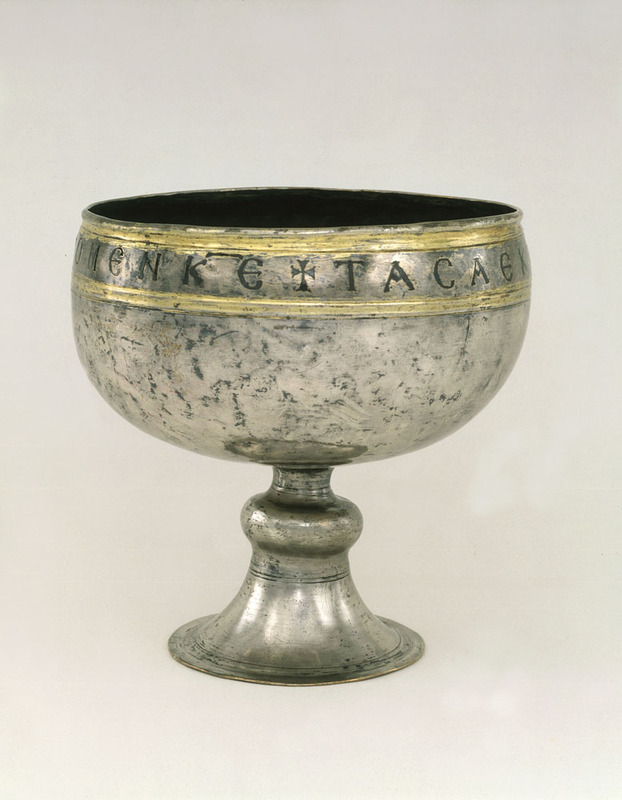 I don’t remember whether I have written to you before about the Antioch (Kuchakji) chalice.The “Antioch Chalice,” Byzantine, first half of the sixth century, silver and silver gilt, Metropolitan Museum of Art, Cloisters Collection 50.4. Kouchakji refers to the dealers and then owners, Kouchakji Frères of Paris and New York. I’m sure it’s genuine, and equally sure it isn’t I cent., as the egregious Prof. Gustavus A. Eisen,Gustavus A. Eichen, The Great Chalice of Antioch (New York: Kouchakji frères, 1923). supported by Strzygowski, pretends, but IV–V.The “Antioch Chalice” is usually dated to the first half of the sixth century. Wilpert’s most nearly tangible reason for doubting it is that the chairs in which the personages in relief are seated are perched on the tendrils of a vine ‘so that Christ and the Apostles may expect a bad fall.’ Again and again, reading Wilpert’s stuff, it struck me that Miss HaightKatherine Haight, Mildred Barnes Bliss’s housekeeper at her house in Sharon, Connecticut. (once of Sharon, I apologise if I misspell her) would not have criticised otherwise. Please let me know what you wish to have done with the carpet.See letters of January 5, 1928; February 1, 1928 ; February 1, 1928 ; March 13, 1928; and April 9, 1928. Later I have just received the enclosed photo.The photograph, if still extant, is not known. The objectThe object in question is the “Icon of the Virgin,” Byzantine, twelfth century, silver gilt, 6.0 cm x 5.2 cm x 1.3 cm, Walters Art Museum, Baltimore, 57.1818. The relief was in the possession of Stanley Casson (1889–1944) before 1930 and may have remained with him until his death. It was represented by a number of dealers and auction houses, beginning with Spink and Son, London, before 1946, until it was acquired at auction by the Walters Art Museum from Parke-Bernet, New York, on May 12, 1949, lot 271. See Stanley Casson, “Four Reliefs of the Byzantine Period,” The Burlington Magazine for Connoisseurs 57, no. 330 (September 1939): 128–133, pl. B. is of silver, and it looks very good: date 1060–1070.The object is now generally dated to the twelfth century. Mais voici le chiendent:“But here’s the catch.” it belongs to Casson,Stanley Casson (1889–1944), an English classicist and archaeologist at New College, Oxford, who conducted field work for the British Academy at the hippodrome in Constantinople. See his obituary in The Annual of the British School at Athens 41 (1940—1945): 1–4. of the New College, Oxford, who conducted the excavations in the Constantinople hippodrome last year, and Casson modestly wants £ 2,000 for it. It isn’t often that a gentleman gets hold of anything that one would like to buy, but when he does. . .! Now, I happen to know that Casson is trying to buy from AndronikosLittle is known about the Istanbul antiquities dealer Andronikos. of C’ple those enamelsThe pieces included an enameled cross, two enameled “jewels,” and a ring; they were eventually acquired by Adolph Stoclet. See also letters of January 5, 1928; May 10, 1928; September 12, 1928 , and October 23, 1929. Precisely which enamels came from Andronikos is not easy to ascertain. The cross is possibly the enameled reliquary cross from the Stoclet Collection now in the British Museum, M&ME 1965, 6-4, 1. of which I sent you photos last autumn, and I have no doubt that his idea is to get, by selling this silver B.V.,“Blessed Virgin.” the money to buy the enamels, which we would then see offered on the Western market for God knows what—£5,000, £10,000? Things are really getting to be most hideously expensive. Let me know if you want me to have a try for the enamels, and if so what price. It’s not impossible that Andronikos, who is over 80, will get tired of waiting, will want money and be willing to consider a reasonable offer. I’m sure of the objects’ authenticity. I went to see Mallon in Paris, but he was away. He hasn’t received the big rider stuffThis “rider textile” has not been identified. yet, and hadn’t anything remarkable—except one piece of moonlight Persian velvet. Please, dear Mildred, send me back the enclosed photo. of Casson’s bit at once. I only send it to you as a curiosity: it really is very good in style. I had two days in Ravenna, one in Florence, a week in Rome, then Antigny, Paris, a day in Milan, a day in Venice, and back here. Do you know the Persian hunting carpet in the Poldi Pezzoli in Milan?Dated hunting carpet (1542–1543) in the Poldi Pezzoli Museum, Milan, inv. d.t. 1. See Jon Thompson and Sheila R. Canby, Hunt for Paradise: Court Arts of Safavid Iran, 1501–1576 (Milan: Skira, 2003), 296, no. 12.19. It was once in the Royal Palace at Monza, and I think it the finest carpet I’ve ever seen (pending Sanguszko’s?) Wool, of course, and hunting scenes in the middle, on a dark green ground. Scrolls in the border. It knocks spots out of those in Vienna, to my mind, and the Vienna ones knock spots out of any in London or Paris. When are you coming? Please let me know as long in advance as possible.